In this story I would like to address CHT (Cylinder Head Temp) measurement on Corvairs. In the 20+ years I have been working with Corvair flight engines, I have written a great number of informative posts and stories on this topic, and I have also covered this in stories on cooling systems, instrumentation, human factors for lower time pilots and how CHT relates to detonation threshold. My comments on these topics can be found in our manuals and on both websites. The information we have shared is from personal measurement on several of our own aircraft, dozens of test engines in extensive ground runs, comparative instrumented engines, and a data from a number of experienced Corvair powered pilots Like Dan Weseman and Woody Harris. All of this has been collected and correlated with my professional A&P perspective, and often discussed at great length with other trained professional aircraft mechanics like Gus Warren and Arnold Holmes, whose experience includes extensive Corvair flight time, in addition to many certified aircraft engines. My data includes many aircraft that worked well, and a handful that didn’t. It is big picture, not myopically gleaned from looking at one or two engines, listening to stories and jumping to a conclusion. I do not consider myself ‘brilliant’ about this topic. The value of my perspective comes from simple observation of data over a long period of time, working with builders and being in the best position to gather all the data. This is the opposite of just following a few stories that seem to support a pet narrative. Part of what motivates this story is hearing from builders who have been told a number of myths about Corvair CHT info. One builder was told he “Has to have 6″ air inlets.” Others have been told that the GM CHT locations don’t work. None of this is supported by observed data, it is opinion from people who just think their pet theory is right. The myths are not always malicious in origin, but well intentioned and malicious myths are both myths just the same. Two very prolific sources of this information are people jumping to conclusions based on little experience. If someone has never soloed a Lycoming, Continental nor Corvair powered plane, they can still have an opinion on CHT, it just isn’t worth sharing with builders who need factual, unbiased data. 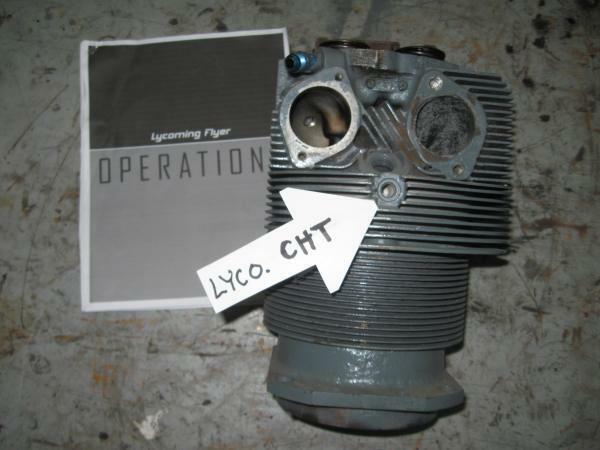 Above, a Lycoming O-320 (160hp) cylinder that I own. The 320 is the most respected and prolific light aircraft engine ever built. You are looking at the bottom of the cylinder, the 320 has both the intake port (left) and the exhaust port (right), on the bottom of the head. The arrow points to the CHT probe location. One of the people telling builders his view that under plugs was the only place for CHT obviously didn’t know that all Lycomings use this location, which is very much like the GM Corvair location. For most Lycomings, the CHT limit is 475F. While I am thought of as a Corvair guy, Our hangar also contains a C-85 and an O-290, and parts of many other aircraft engines. My perspective comes from broad experience and spending time with aviation professionals with far better backgrounds. A mechanic may be clever with EFI or experienced with vehicles imported from the fatherland, but if they have never turned a wrench on nor flown a Lycoming powered plane, their perspective is myopically limited. I really don’t know a lot about modern car maintenance, but I do know a fair amount about planes, and I know enough about both subjects to say that knowing one does not qualify you in the other. On the table next to the cylinder is a 50 page Lycoming operations manual. You can down load it for free off Lycomings website. Every aircraft mechanic I know owns a copy and is familiar with the data inside. It is a great book, and even as a Corvair guy you should read it. Quite often, people will say things that are directly against the experience in this manual, even when they are Lycoming owners, speaking of Lycomings. For example, Dan pointed out to me that Lycomings leaning operation in the book is enrich it until it runs slightly rough and lean it only until it runs smooth, exactly the opposite of what most people think. Either you are the kind of builder who is inclined to follow the recommendations of the company that built 300,000 of the engine you are running or you are the kind of guy who is going to follow a story written in Flying magazine by a guy who has never pulled a cylinder off any aircraft engine. For several years at Oshkosh there was an alternative engine guy who’s background was car racing who liked Gear Driven liquid cooled V-8’s. He started all of his forums by writing on the board “If Lycoming made a car would you drive it?” I spoke with him a number of times and read the stuff he wrote. He absolutely felt he had nothing to learn from Lycoming, (or most other experienced sources for that matter) He doesn’t write that any more. This is because he was killed by a mechanical failure while flying his plane. It was his second major accident. He killed his passenger also. I spoke with him after the first, and I will tell you he learned nothing from it. Another person using that same engine wanted to put it back in production, after the accident, but he was killed by a similar engine failure. I just read a nice magazine story about a very nice Australian aircraft using the same gear box. A small postscript at the end of the story said that he was killed by a gear box failure. Same magazine had a press release from a new guy who bought the gear box assets to make more of them. You don’t need a crystal ball to predict the next chapter. Don’t have anything to learn from Lycoming? They made plenty of successful geared engines like the GO-435, the IGSO-480 and the IGSO-540. No, they didn’t make cars, but evidently being a ‘race car driver’ doesn’t qualify you to make geared engines either. People who claim that they don’t have anything to learn from the successful experience of people who preceded them tend to attract followers with the same mindset. A harmless social phenomenon when the topic is flower arranging, interior design, modern dance or fashionable footwear. When the topic turns to subjects with consequences, like aviation, builders who plan to die at home in bed with all of their great-grandchildren in the next room, tend to learn from others. Above, the GM Corvair CHT location. Most common question: “Is it on the same spot on both heads?” Yes, because there is only one head. There is no such thing as a right or left Corvair head until we weld the pipes on the intakes, so this is on “both” heads. In 95 and 110 engines it is threaded 3/8″-16. An easy way to put CHT here is to use a 10MM spark plug ring CHT terminal and hold it down with a 5/8″ long bolt with a washer. This will work great. All Corvairs with the exception of ‘Spider’ and ‘Corsa’ high performance models had an idiot light in the dash that was tripped at 575F by a sender screwed into this hole. I had a guy who had never owned a Corvair tell me that the 10mm ring would not work because “it needed to touch the bottom of the hole” Really? the GM sending unit didn’t, and it read just the same. For another view of a Corvair powered plane that is slow climbing, but runs cool, read this story: Gary Burdett, 2,850cc Zenith 750, now flying. (engine selection) I personally verified the temps that Gary is getting by independently measuring them in person, on his plane, at Corvair College #26. I heard from a guy who said he didn’t think it could run that cool, that both Gary’s instrumentation and mine must both be wrong. This comment came from a person who has never seen the plane nor the engine, has no idea where the temps were taken from, nor does he have a running engine nor a pilot’s license, yet he is still quite sure he is correct, unwilling to even entertain the possibility he is wrong. Some people you are just not going to reach, and that is OK. Plenty of people who stayed on land back in Spain felt that if Columbus had just sailed a little further, he would have fallen off the earth, and nothing Columbus did was going to change their minds. Above, an eight year old photo from the old hangar in Edgewater. In the foreground, my 1966 140HP four carb Corsa, behind it Kevin’s 1965 180HP turbo Corsa. Both of these cars have factory CHT gauges. The factory turbo cars did not use a waste gate, they just had an oversized turbo and a very specific muffler, and the result was a very simple system that did not go into boost until the car had some serious rpm, the throttle mostly open and the CHT over 400F. Below this, the head dissipates the heat energy the turbo needs to make boost. The engine will not make its full output until it is up in the 500F range. Granted, they didn’t have to run this way for a hour at a time, but I have met people who don’t believe that Corvair engines were run that hot in the cars without damage. They hold this opinion even though they have never driven a turbo Corvair and seen the CHT gauge with their own eyes. I have driven 120,000 miles spread over the 4 Corvairs I have owned. At the time the Photo was taken, Kevin owned 7 other Corvairs, Grace had her 65 van, Gus had a ’67 Monza and Dave had a ’69 Monza. I felt that our ‘hangar gang’ was qualified to comment on Corvair operation. I have met many people who have never owned a Corvair with strong, but incorrect opinions about how the engines ran in cars. Explaining the basis of my observed experience to the contrary, they often stick to their opinion, they are more comfortable with any antic dote that seems support their opinion than a mountain of contrary evidence. This is especially true if the person in question is a car mechanic. Corsa models, (140 and 180 HP) have the hole threaded 3/8″-24, same as a Lycoming. To make the 95 heads on my plane compatible with standard Lycoming probes, I have helicoiled them for 3/8″-24 threads. The probes I am using are Electronics International P-101s with A-101 quick detach fittings. They are in the Aircraft Spruce catalog on page 523. If a guy wants to share an opinion about temp measurement that is contrary to mine, it might be worth asking what kind of test equipment he us using. If he looks at the head of an engine he did not see run and wants to jump to a conclusion, or he wants to use internet data from a builder who never set the timing with a light or is running a non aircraft carb, it probably isn’t going to be as accurate as I can collect in person. 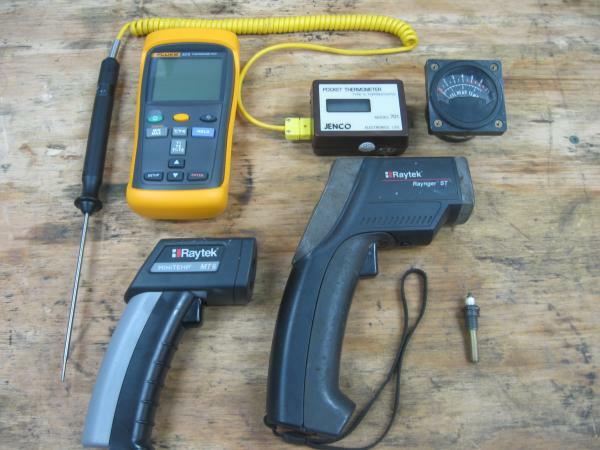 From my tool box, top row, Fluke two channel digital type K temp meter, accurate to less than 1/2% of reading, compares two probes simultaneously, reads all common aircraft probes. Digital type K contact thermometer, 0-1,200F, accurate to 1 degree. Westach CHT, common in aircraft, not accurate source of info, but commonly quoted on net. Bottom, two Raytech non-contact thermometers. accuracy limited to surfaces that don’t have shiny finish, tends to read too high in many circumstances. OK for quick check looking for cold cylinder, but weak on data gathering. Small spark plug item: Original AC thermistor from 140/180 HP Corvair. Same part actually used on many certified aircraft such as Twin Comanche. 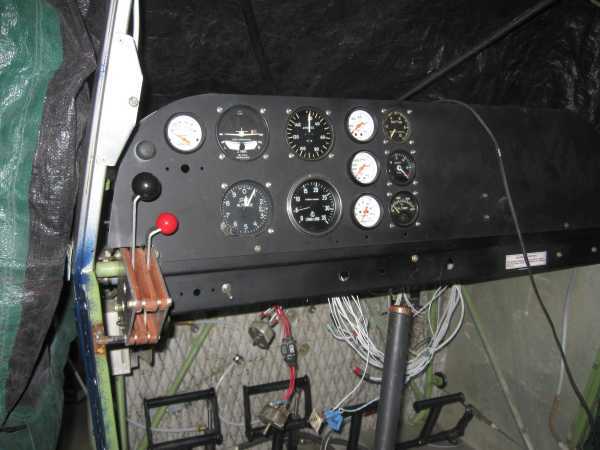 Above, the instrument panel in our Wagabond, in the process of being wired. The gauge in the lower right is the CHT. It is a very accurate military unit with a little stamp on the back that says “Calibrated MCAS Cherry Point.” It takes type K thermocouples and need no power at all to read, it is independent of the electrical system of the plane. There is a hole under the gauge for a left /right switch. I like traditional gauges, and 2 CHT’s in the stock location make sense to me. You can also run 2 CHT’s in the stock location with many Glass Cockpit displays. If you want to run 6 CHT’s, then you are probably going to run them under the plugs. If you do this, know that we have gathered plenty of data to say that these will actually run hotter than the CHTs in the GM location because they actually read the temp of the plug as much as the temp of the head. They can be a little pain during a plug change, and if you are not careful, you can over torque one in a plug hole with a helicoil or a time sert in it, and the sending unit will stick to the top of the thread and extract it when you unscrew the plug. One way to avoid this is to run a copper washer, then the sender, then the plug, but this is even more likely to show the temp of the plug. I have wired plent of planes for 6 CHTs, I am not enough of a zealot about it to really care about what other people would like in their planes. Dan has 6 CHT’s under the plugs in the Panther and it works great. 1) Is the timing set correctly with a light? 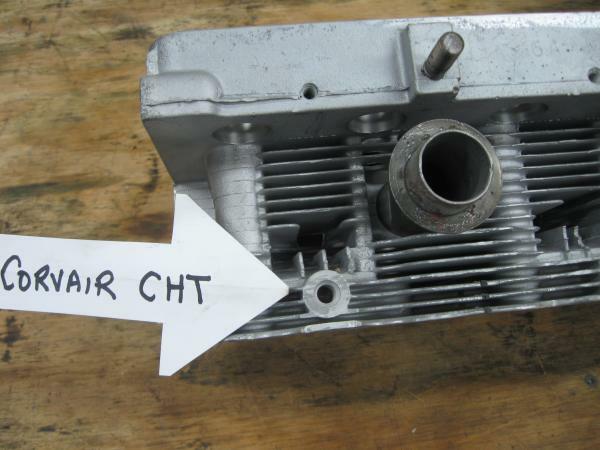 2) If there is a significant L/R difference, especially at part throttle, and it has a flat slide carb like an aerocarb, Elison or a Rotec, it is the carb causing this effect. Butterfly style aircraft carbs don’t do this. 3) Does the cowl have inlet rings? 4) Does the outlet have a lip on it and is it 3X the size of the inlets? 5) Is the instrumentation correct? 6) Are they the correct spark plugs? 7) Is the fuel high enough octane? William, Hi. It would be easier for me put the copper washer, then the probe, then the plug. What I wasn’t sure of does this raise the plug out of spec, or is the distance, nominal?